This 4-bedroom villa for up to 8 guests is located in Asteri and has a private swimming pool. 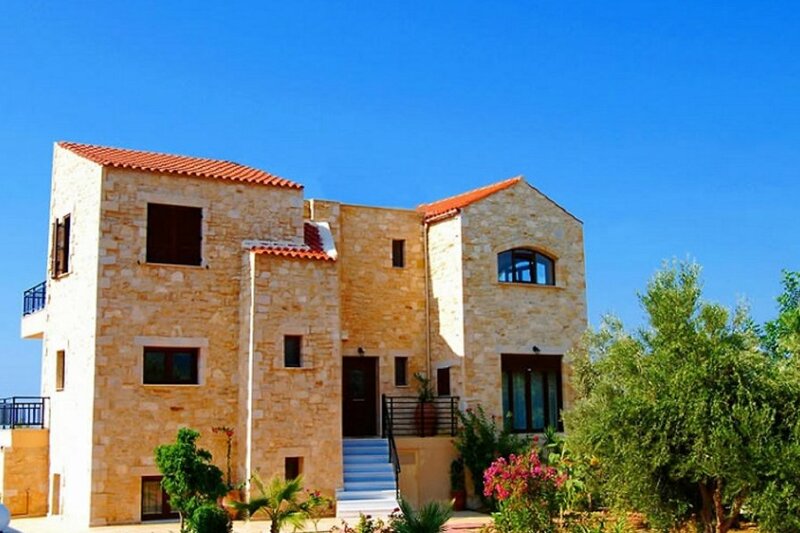 Child friendly, very beautiful villa Louloudakis Villa 2, 1'200 m a.s.l., 3 storeys, built in 2008, surrounded by trees. In the district of Asteri, 12 km from the centre of Rethymnon, in a quiet, sunny position, 2 km from the sea. Private: property 160 m2, lawn for sunbathing, beautiful garden to relax, swimming pool (40 x 50 m2, 01.05. and 31.10.). Paddling pool, outdoor shower, terrace, garden furniture, barbecue, fireplace. In the house: WiFi, air conditioning, washing machine. Linen change 2 times per week. Towel change 2 times per week. Parking. Supermarket 2 km, restaurant 1.5 km, sandy beach 2 km. Nearby attractions: Heraklion Airport 75 km, Rethymnon Port 11 km. Please note: car recommended. Suitable for families, baby equipment on request.